Sen. Ted Cruz (R., Texas) next week plans to introduce a bill calling for both the unconditional, safe return of several U.S. citizens and permanent legal residents imprisoned in Iran and also the creation of a multi-national task force to try to secure their release, according to a Senate source. 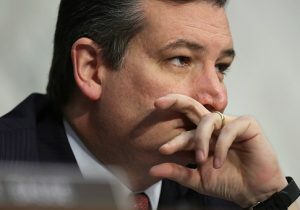 Cruz's measure will mirror a bipartisan House resolution sponsored by Reps. Ileana Ros-Lehtinen (R., Fla.), Ted Poe (R., Texas), Nita Lowey (D., N.Y.), and Ted Deutch (D., Fla.). That version calls on the Trump administration to make securing the release of at least six U.S. hostages the "highest of priorities." It also urges the United States and its allies who also have citizens detained in Iran to create a multi-national task force to leverage resources and share information in an attempt to win the prisoners' freedom. Iran has over the last several months jailed several dual-nationals of other western nations, including the United Kingdom, France, Germany, and Canada. The move comes in the wake of stepped up efforts by several families of prisoners held in Iran to try to secure the release of their loved ones. The families feel a new sense of urgency after the death late last month of Otto Warmbier. Warmbier, a University of Virginia student held in North Korea for a year and a half, was released in mid-June only to die just days later from complications his family believes were the result of his detainment. The family of Nizar Zakka, a Lebanese citizen and U.S. permanent legal resident, this week released an audio of him from inside Iran's notorious Evin Prison pleading for international assistance in securing his freedom. The family and attorney have said time is running out because his health is sharply deteriorating. In April, the family of Siamak Namazi, an Iranian-American businessman, and his father Baquer, issued a similar call for action for the aid of both Namazis, who the Iranians have detained on spying charges since 2015. The House Foreign Affairs Committee plans to hold a hearing later this month featuring testimony from the families of U.S. hostages held in Iran. During the height of the presidential campaign, then-candidate Trump tweeted about the 10-year prison sentences an Iranian judge leveled against the Namazis for alleged "spying," which their families vehemently deny. "Well, Iran has done it again. Taken two of our people and asking for a fortune for their release. This doesn’t happen if I’m president," he tweeted. Trump administration officials have since said that securing the release of Americans held overseas in Iran and elsewhere is a top priority, and Warmbier's death has given U.S. officials a sense of urgency. Deputy National Security Adviser Dina Powell and other administration officials have recently met with families of Americans imprisoned in Iran. Earlier this year, the administration also secured the release of Aya Hijazi, an Egyptian-American charity worker, imprisoned in Cairo three years ago. The new push, however, comes as tensions between the U.S. and Iran are flaring. The Trump administration recently authorized U.S. forces to take military actions against Iranian-backed forces in Syria in order to protect American interests. Iran-backed forces, including Hezbollah, have clashed with U.S. forces in Syria in violation of agreements worked out between Washington and Moscow to avoid the various factions fighting the Islamic State in Syria from coming into conflict. The Trump administration is conducting a review of the U.S. Iran policy, many details of which the Free Beacon first reported. The administration leveled new economic sanctions in April against senior Iranian officials and its prison systems for what White House officials said were widespread human rights abuses, including systematic torture of those being held. Suleimani is responsible for running Iran's Evin Prison, which is known for its harsh conditions and forced interrogations. Many, if not all, of the prisoners with U.S. citizenship or green cards are being held there.